Nobody's perfect. We are all going to have our wins and losses. 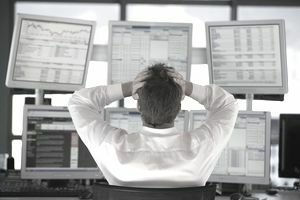 However, some of the mistakes you might make when trading stocks are actually pretty common, and by no means reserved exclusively for you alone — the majority of investors make many of the following mistakes. In fact, in some cases, the investor may continue to make the exact same mistake many times over, when they do not learn from their previous errors. Perhaps you have some direct experience with just exactly such a situation. The good news is that most of these mistakes can be avoided simply through awareness. We will take a look at the most common mistakes here, and identify ways in which may be able to stop the bleeding (or even turn them to your advantage). Too often investors gravitate towards the latest "hot" or fancy–sounding industry. The may know very little, or even nothing, about technology, or biotech, or the specific business the underlying company is engaged within. Of course, that does not stop them from trying to jump on to what they expect to be the next profitable train. In this scenario, the investor is overlooking all the advantages and benefits they would have over investors who know little about the industry itself. When you understand a business, you have a naturally built-in advantage over most other investors. For example, if you run a restaurant you'll be in tune with businesses involved with restaurant franchising. You will also see first-hand (and before they become public knowledge) the habits of the patrons. By extension you will know if the industry is booming, getting slower, or cooling down, well before the vast majority of investors. To take our scenario a step further, by seeing the trends in the industry in which you are engaged, you should be able to spot some opportunities to make great investment decisions. First-hand knowledge, it would seem, can mean investment profits (or avoiding losses). When you invest in a company that is "above your pay grade," you may not understand the subtleties and the complexity of the business in question. This is not to say that you need to be a gold miner to invest in gold mining companies, or a medical doctor to invest in healthcare, but that certainly wouldn't hurt! Anytime you can have an unfair advantage over most investors, you should press that advantage as far as you can. If you are a lawyer, you may do better with knowing when to invest in businesses which make their revenues through litigation. If you are a surgeon, you'll have a better understanding about how well (or poorly) a surgery robot is performing their task, and as such may have an inside track on how well the underlying stock may perform. This is especially true when dealing with penny stocks. Most people treat low-priced stocks like lottery tickets, and anticipate that they can turn their $500 or $2000 into a small fortune. Of course, this can sometimes be true, but it is not an appropriate mindset to have when you're getting into investing. You need to be realistic about what you are going to expect from the performance of the shares, even if such numbers are much more boring and mundane than the pie-in-the-sky levels for which you may hope. Look at the performance of the stock up until this point. Also, watch all the other investments that are competitors in the same industry. Historically, has the underlying investment gained 5% or 10% per year, or have those moves been closer to hundreds of percentages? Do most companies in the industry see their shares moving 1% at a time, or is it more common for them to jump by tens of percentages? Based on the previous performance, while not indicative of what may be to come, you could get an idea of the volatility and trading activity of the underlying shares. Typically, a stock will continue to act mainly as it has in the past, and usually that will be inline with the overall industry. You would be blown away if you could see how different your trading style becomes when you are using money which you cannot afford to risk. Your emotions get heightened, your stress level goes through the roof, and you make buy and sell decisions which you otherwise would have never made. An old Japanese proverb says that, "you will eventually lose every dollar with which you gamble." You should never put yourself into the high-pressure situation where you are putting money on the line which you need for other reasons. The first thought is to only invest in speculative shares with 'risk money.' However, we can take it a step further, and suggest that you do not even use real money when you are getting started. Consider Paper Trading, which is no-risk, and requires no money whatsoever. Then, once you get good at Paper Trading, you can migrate towards trading real cash. When you invest with money that you can afford to risk, you will make much more relaxed trading decisions. Generally, you will have much more success with your trades, which will not be driven by negative emotions or fear. We may have touched on the different emotions you can have when you're investing, but one of the most costly ones is impatience. Remember that stocks are shares in a particular business — businesses operate much more slowly than most of us would typically like to see, or even than most of us would expect. When management comes up with a new strategy, it may take many months, if not several years, for that new approach to start playing out. Too often investors will buy shares of the stock, and then immediately expect the shares to act in their best interest. This completely ignores the much more realistic timeline under which companies operate. In general, stocks will take much longer to make the moves that you are hoping for or anticipating. When people first get involved with shares of the company, they must not let impatience get the best of them… or their wallet! This is an extremely important point. There is no shortage of so-called experts who are willing to tell you their opinions, while packaging and presenting them as if they are educated and endlessly correct knowledge. One of the most significant parts to investing well is to identify and isolate sources of guidance which consistently help you achieve profits. For every good piece of information which may be of benefit, you will probably see hundreds of pieces of really horrible guidance. Always remember that just because someone is being featured or interviewed by top media, does not mean they know what they are talking about. And indeed, even if they do have a stellar grasp of their topic, that still does not mean they will be right. Thus, your job as an investor is to assess which sources of information should be trusted, and have demonstrated a reliable and ongoing trend of wisdom. Once you have identified those individuals or service which may lead to profits, you should still only partially rely on their thoughts — combine those with your own due diligence and opinions to construct your trading decisions. If you hear about a stock for free, especially a penny stock, it is almost certainly being driven by players with significant hidden motivations. This may not be true if you hear about a professional's opinion on something such as CNBC, but it is absolutely and un-categorically true when you hear about the latest "hot penny stock" that is going to go through the roof (according to greedy promoters). There is an endless line of dishonest stock promoters out there. Their obsession is to find ways to profit from your actions... you lose, so they can gain. The bad side is that for them to profit, you will probably need to lose. Investing in speculative shares is mainly a zero-sum game, meaning for someone to make a dollar, someone else has to lose a dollar. This is why scam artists and promoters take such efforts to drive up worthless shares. The more money they get to push the stock prices higher, the greater the profit they'll make when they walk away and leave everyone else in the dust… and broke. In many cases, the majority of people only hear about an investment when it has already performed well. If certain types of stocks double or triple in price, the mainstream media tends to cover that move, and tell everyone about how hot the shares have been. Unfortunately, by the time that the media tends to get involved with a story about shares rising, it is usually after the stock has reached its peak. The investment is overvalued by this point, and the media coverage comes late to the game. Regardless, the television, newspaper, internet, and radio coverage push the stocks even higher into excessively overvalued territory. We have seen this trend play out recently with the recreational marijuana stocks. Some of these tiny companies had only two or three employees, but that did not stop them from being valued at a corporate worth of about half of one billion dollars! In other instances, an old nearly defunct gold mine would add 'cannabis' or 'marijuana' to the name of their company, and the shares would instantly double or triple in price. At no point were investors looking into the company deep enough to realize all the problems; tens of millions of dollars in debt; no revenues; millions in ongoing losses each month. Averaging down is typically used by investors who have made a mistake already, and they need to cover over their error. For example, if they bought the stock at $3.50, and it drops to $1.75, they can make that mistake look a little bit less awful by purchasing a whole bunch more shares at this new, lower price. The result is that now they've bought stock at $3.50, and more at $1.75, so their average price per share is much lower. This makes their loss on the stock appear far smaller. However, what is really happening is that the individual bought a stock which dropped in value, and now they are sinking even more money into this losing trade. This is why some analysts suggest that averaging down is just throwing good money after bad. Averaging down is typically used as a crutch to help investors cover the mistake they have already made. A more effective strategy is to average up, where you purchase more of a stock once it starts to move in the direction you are anticipating. The share price activity is confirming that you made a good call. To do the proper amount of due diligence, especially with highly speculative and volatile penny stock shares, it takes a significant amount of work. The more due diligence you perform, the better your investing results will become. If you look at every warning sign and every aspect of a company, you're much less likely to be surprised by any individual event which afflicts the business. When you see the potential risks, and you feel confident in all the aspects of the company into which you've been looking, you are part way to having performed appropriate due diligence. The vast majority of investors do not even come close to doing enough due diligence into the companies that they invest in. Most people just want to find a company that seems to make sense, and should increase in value because the underlying industry (at least in their mind) is "up-and-coming." For example, electric cars will become a bigger deal soon, so people might assume that investing in an electric car stock is a good idea. Unfortunately, to be a good investor takes a lot more than the simplified, surface considerations and shallow logic. If you consider the turn-of-the-century, there were over 1,900 car companies in America. The automobile was going to be a big, important invention that we would never be without… but almost every single one of these 1,900 companies went completely bankrupt. The end result is that most investors in car companies at the very beginning, when the adoption and growth of this groundbreaking concept was just getting started, wound up getting wiped out. Some enhanced due diligence would have helped avoid the losses. Most investors don't even realize they're doing this, but a lot of times they will believe that 'such and such' is a good idea, and therefore the stock price will increase. If investing were that simple, we would all be very rich. Yes, a cure for cancer is a great idea. Yes, generating municipality revenues through sales of marijuana seems logical. Unfortunately, it takes a lot more than a simple good idea for the shares to be a good investment. Look back to our previous discussion about the 1,900 automobile companies. A great, simple, single concept which is more relevant today than ever... but a minefield for investors, with 99.9% of money lost. Instead, look for a good concept, but only focus on the highest quality companies within that space. They should have growing revenues, expanding market share, and proven management teams, just like the penny stocks we profile for you here. Ideally, you will not be committing too many of these common errors. However, the fact of the matter is that the majority of investors, in most cases, will continually fall back to making some of the mistakes which we've discussed in the article above. Luckily, you can use your losses and mistakes to learn how to avoid them next time. In fact, most people learn more from their losses than they do from their gains. Given enough time, and a sufficient number of bad trades, you will be in a much superior (and more profitable) situation. Ideally, you will phase out the common mistakes quickly enough that you still have a big part of your portfolio left on the other side. Then, with your newfound 'enhanced' wisdom, you should be able to start gathering some profits!